In bringing home a new dog, your task is to carefully introduce your new canine companion to other pets in the household to prevent conflict among the animals. Making the right introductions can take some time, and some pets don’t adjust to their new siblings for weeks or even months. Take it slow, be diplomatic, and supervise all interactions until everyone can be trusted. If you already have a dog who’s used to being the only dog in the house, he probably will see another dog as a trespasser and want to make darn sure that the new dog knows his place. A new dog on new turf may defer to the previous resident dog, but some dogs just tend to have stronger personalities and try to be the leader. If you put two such dogs together, you can have squabbles. Dogs learn crucial dog-to-dog communication skills when they’re between 3 to 6 weeks of age. Puppies deprived of this time together may not understand how to communicate well with other dogs. Adopt a female dog if you already have a male dog, or vice versa. Male and female dogs together are less likely to fight each other than dogs of the same gender. Spayed or neutered dogs also are less likely to enter the fray. Introduce the dogs first on neutral territory — the shelter the new dog comes from, a quiet corner of a park, or the home of a friend. Keep both dogs on their leashes with each handled by a separate adult. You must be a strong presence and maintain control. When both dogs think you’re in control of the situation, they may feel less anxious, fearful, or defensive. Remember that the first dog may see your home as his territory and feel threatened that another dog is on his turf. Be patient and supervise all interactions until the dogs accept each other. Be patient. Dogs may take a few hours to become fast friends, but some dogs may never get along very well. The relationship probably will improve with time, but it can take weeks or even months. 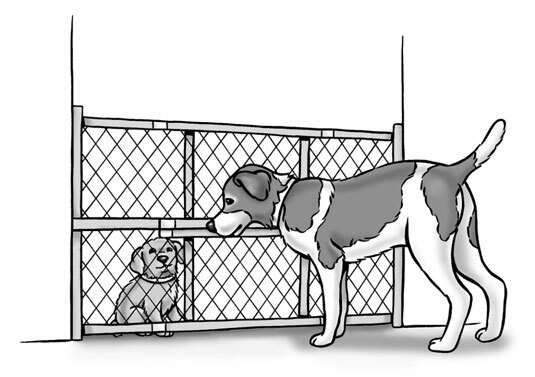 Let both dogs spend some extended getting acquainted time on either side of a baby gate, screen door, or other barrier that neither is able to jump over. Doing so can help dogs gain interest in each other without the threat of one dog invading the other’s space. Give each dog his own space, his own den, and room to run away to in case of a confrontation. A brand-new kennel or crate won’t automatically be the resident dog’s property, so it gives the new dog a place to feel safe. Keep the door open so the new dog can go in whenever he needs a safe spot, but keep the resident dog out of the new dog’s den. Give both dogs plenty of attention and separate training time, especially your resident dog, who may be feeling neglected. Make sure he knows you aren’t replacing him! Take it slow. Not everybody wants a new sibling. Let both dogs take time getting to know each other, and supervise all interactions until they work out their new relationship. A baby gate can help your new dog and your resident dog get acquainted. If your two dogs get into a fight, don’t stick your hand in the middle or grab a collar — you may get hurt! Distract the dogs by spritzing them with water from a spray bottle or make a loud noise, like shaking a can of pennies or pebbles. As soon as they stop fighting for a moment, separate them immediately and put each in his respective den or separate room to cool off. If you can’t seem to resolve the issue, call a local dog trainer who uses positive reinforcement. A trainer can work with you and your dogs, giving you some strategies tailored for your individual situation.